The nuclear powerhouse of Chernobyl and the city of Pripyat of the Soviet Union were the Communist Paradise on Earth. It was the incarnation of the 20th century utopia. The four nuclear reactors at the Chernobyl Nuclear Power Plant in Northern Ukraine were regarded as the power- and workhorse of the great Soviet Union. Next to the nuclear reactors and the many other industries associated with the nuclear energy production, a wonder of the New World, a city called Pripyat, had been established for the engineers, scientists, workers and their families. Pripyat had become one of the most modern cities of the Soviet Union with 20 schools, kinder gardens, supermarket, state of the art hospital, post office, railway station, music academy and conservatory, theater, cinema, 10 sports facilities and in- and outdoor swimming pools, leisure and amusement parks, a boat yard at Pripyat river and many other modern facilities. Pripyat also had a large industrial complex that officially produced cassette tapes, but the real products coming out of the factory were top-secret electronics for the Soviet military machine. The production was so well organised that not even the workers knew what they were doing. Pripyat was a state of the art example of urban architecture and planning. When the city was at its height it housed more than 50.000 citizens, mostly young families. The average age in the city was just 27 years. The housing and other services were more or less free of charge, and the supermarket had all kind of stuff on the shelves for sale, which was not the case in most other parts of the Soviet Union. Pripyat also had a direct train connection to Moscow. The city was one of the rare places where you could actually spend your money. 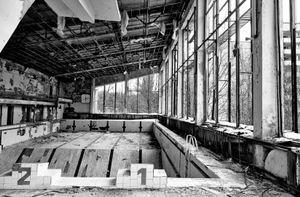 Pripyat was the Communist paradise on Earth and an example for rest of the World to follow. 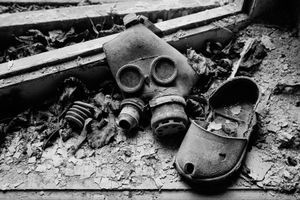 At 1.23am on 26 April 1986, a series of explosions destroyed Reactor 4 of the Chernobyl Nuclear Power Plant. The communist paradise had vanished forever in a split second. Reactor 4 was up for a regular routine safety check to test whether the system could keep the reactor core cool in the event of a power cut. The power of Reactor 4 was to be regulated by 211 boron carbide control rods that were raised up and down to moderate the rate of reaction. The reactor was covered by a steel and concrete shield of three meters thick walls with a diameter of 17 meters. The process gradually went out of control and the 1,600 10-meter channels filled with uranium fuel of the 1000 megawatt so-called Reaktor Bolshoy Moshchnosti Kanalnyy (RBMK) reactor started to melt down. The test caused an unexpected power surge, the emergency shut-down button was pressed, sending the 211 control rods into the core. Within four seconds, steam pressure and power readings went off the scale; the zirconium fuel assemblies and the channels containing them disintegrated. The reactor was torn apart by the first of several catastrophic hydrogen explosions. The 500-tonne reactor was hurled into the air exposing the core. The nuclear explosion was 400 times more potent than the Hiroshima bomb. Fifty tons of uranium fuel from the reactor core vaporised immediately, and were blasted high into the atmosphere; a further 70 tons of uranium and 900 tons of highly radioactive graphite were dispersed into the area around the reactor, starting more than 30 fires. The 800 tons of graphite that remained in the reactor core caught fire at once, creating a radiological inferno that would burn for 10 days, sending a continuous plume of lethal radionuclides roiling into the sky. The entire reactor had become an apocalyptic sight and flames shot into the sky. From the centre of the building, an unearthly, delicate, blue-white light shot upwards into the night - a shaft of ionising radiation from the exposed core. Scientists and workers around the reactor and, some kilometers away, citizens in the city of Pripyat came out to observe the unearthly beautiful light. People momentarily became transfixed by the eerie glow and mysterious light - known as Cherenkov's Light. Nobody knew that they were standing in a lethal field of gamma radiation. 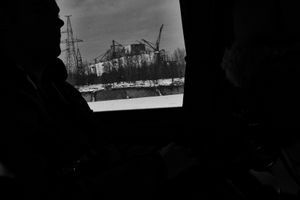 For several days after the explosion the train from Kiev and Pripyat to Moscow, which was passing close to Reactor 4, continued to run as scheduled. The authorities at Chernobyl and Ukraine were too afraid of informing the Communist leaders in Moscow about the scale of the disaster. Passengers on the trains passing nearby Reactor 4 were looking out of the windows admiring the beautiful Cherenkov’s Light. 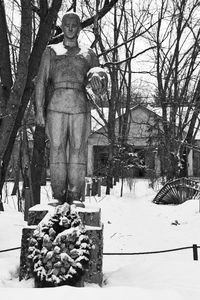 The Soviet government would wait three full days before they admitted that something had gone terribly wrong at Chernobyl. The radioactivity was first recorded days after at the Forsmark Nuclear Power Plant in Sweden nearly 1100 kilometer away from Chernobyl. The workers at the Forsmark plant were found to have radioactive particles on their clothing. That’s how the World started realizing that something had gone completely wrong. On 27 April 1986, the first 21,000 people were evacuated from Pripyat. People were told that they would return three days later, and they got 40 minutes to pack their belongings. Nearly thirty years later, Pripyat is still no-man’s land and the most radioactive place on earth. And it will remain so for thousands of years. In a suburb of Kiev, we met Nicolai Steinberg. After the accident at Reactor 4, Steinberg was appointed technical director of the plant. He was charged with containing the wreckage of Reactor 4, protecting the population of Ukraine and Belarus from the contamination spread across the landscape, and restarting the three remaining reactors of the power plant, shut down in the immediate aftermath of the accident. Steinberg worked from an office with lead plates covering the windows and developed an instinct for sensing radiation when he encountered a field in excess of 135 roentgen an hour. As he told us, it felt 'like a punch in the eye'. Steinberg later became vice-minister for nuclear energy in Ukraine. He was a gentle and charming man deploying diplomatic evasiveness of being a former politician. He did admit though that the situation in Ukraine was terrible and that the country and its politicians were all infected by corruption. 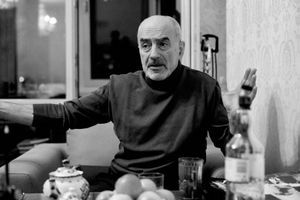 He spoke slowly and with a low voice, a result of throat cancer diagnosed in 1996, but he refused to connect it with Chernobyl. He had smoked for many years, and offered us another whisky. He talked about the glorious days at Chernobyl. Our surprise did not diminish when he started taking about the heroic work he and his colleagues did at Chernobyl and about the wonders of nuclear energy. He still clearly believed in nuclear energy, and what it could offer Ukraine and rest of the World. After the accident the liquidators were told just to spend 45 seconds on the roof of reactor 4. In this short span of time they were to identify an item on the roof and to push it over the side to the ground or place in a hole on the roof. Most of them took no more than one to three shovelfuls before running down and back into the building. A fatal dose of radiation is estimated at around 400REM, which would be absorbed by anyone whose body is exposed to a field of 400 roentgen for 60 minutes. On the roof of the turbine hall, the radiation levels reached 30,000 roentgen an hour. Here a man would absorb a fatal dose in just 48 seconds. When the liquidators returned from the roof, they were given a bottle of vodka to clean the body of radioactivity, a few rubles and were then immediately send on pension. When we visited the exclusion zone in March 2013, there were still some 5000 people involved in cleaning up in the exclusion zone. The new roof of the Sarcophagus – the concrete covered reactor 4 with its dangerous cracks - was under construction to protect future generations. 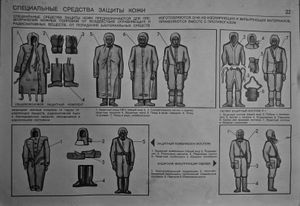 The safety and protection gear that the liquidators wore, lead protection gear, masks and gloves, were largely self-made on site. The Ukrainian photographer Igor Kostin from the USSR news agency Novosti Press Agency in Kiev was among the first to document the accident from a helicopter above the open reactor. We had the privilege of meeting Igor Kostin for three hours at his apartment in Kiev. I recorded the entire conversation, which took place while his wife so kindly translated and served us vodka en masse and Ukrainian snacks. One night a friend of Igor called him. There had been a serious accident at the Chernobyl Power Plant. He didn’t exactly know what had happened, but it was serious. Something big was going on. The friend happened to be the captain of a military helicopter, and who later would be inspecting the Reactor 4 at Chernobyl from the air days after the accident. 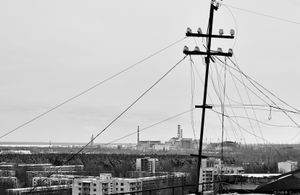 Igor immediately left Kiev and went unauthorized with his cameras on one of the first helicopter flights circulating over the exploded reactor. While on board the helicopter some 25-50 meter above the reactor, Igor wanted some photos of the exploded reactor and he opened the helicopter door to shoot. Even though he was wearing lead protection gear and that his cameras and lenses were stored in a lead box on board the helicopter, the cameras and film rolls were completely damaged by the strong radiation. His Nikon F3 with MD-4 motordrive and lenses were completely damaged, and the first attempt was unsuccessful. But Igor Kostin returned again and managed to get some of the most iconic both aerial and and ground photos of the worst nuclear disaster ever. Radiation was seen on his photos. Igor went several times to the roof of the exploded reactor to photograph the liquidators at work. The radiation was at 1500 roentgen an hour. The deadly dose was 500 roentgen an hour. As Igor told us “fear came later”. Igor showed us his photos, and talked about the images and his feelings. He could talk for hours about every single photo. 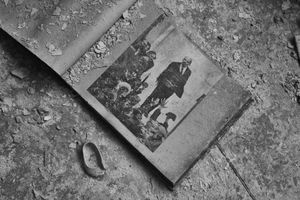 Even after so many years, it was clearly emotionally difficult for Igor to talk about his photography work at Chernobyl. He was now focusing on trying to convince the Ukrainian authorities to construct symbolic monuments, which he had designed to in honour the many victims and for future generations to remember what happened at Chernobyl. Igor was against nuclear power – it might be cheap, but it was criminal. 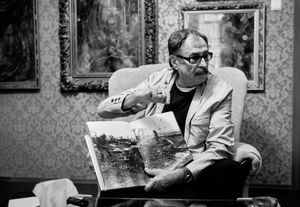 There were four photographers, who covered the Chernobyl accident. Igor Kostin is probably the only one still alive today. The others have died of cancer and heart attacks. It was a real miracle that Igor is still alive. Even though Igor Kostin had undergone several thyroid operations and had been diagnosed with cancer, he seemed surprisingly vigor and with lots of energy. I had brought one of his books “Chernobyl: Confessions of a Reporter”, which he signed. When we left he gave us a bottle of vodka. Igor Kostin undertook some of the most dangerous photography work ever done by man. 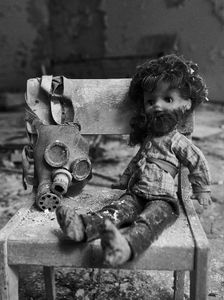 The photography work at Chernobyl earned him, among others, five World Press Photo Awards. Igor Kostin is a great personality and one of my heroes. Some of the workers on duty at Reactor 4 the night of 26 April 1986 died on the spot or later in Hospital No. 6 in Moscow. Their eyes had changed colour and with blisters on their hearts. 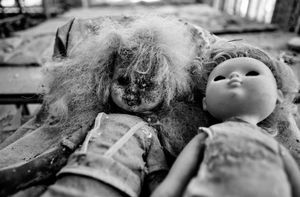 Their bodies were so radioactive they were buried in coffins made of lead, the lids welded shut. 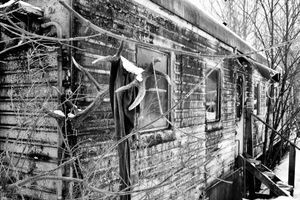 Some people living in the rural areas around Pripyat refused to be evacuated from the area and their properties. 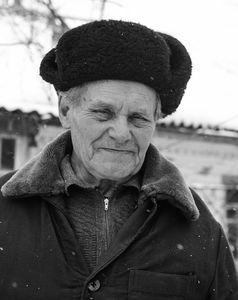 Ivan Ivanovysh Semenuik and his wife Maria Kindrativna Semenuik lived in village Paryshuv not far from Reactor 4 in the exclusion zone and have done since the accident in 1986. Only right after the accident they were evacuated. On 1988 they returned two years after the accident. Paryshuv was their home and where they were born. They did not want to live elsewhere. Today there are less than 200 people living permanently scattered in abandoned villages in the exclusion zone with a radius of 30 kilometer. 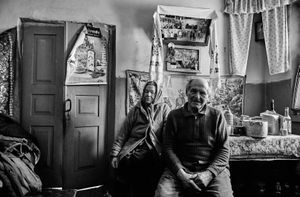 All of them, including Ivan and Maria, live in complete isolation and loneliness without any basic services. 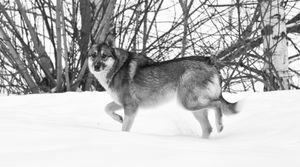 The only companions in the areas are wolfs, elks, deer, wild horses, pigs, lynx, beaver, eagle owls, myriads of birds and many other wild animals that now inhabit the excluded area. The exclusion area, with the size of Luxembourg, is now a large ecological laboratory, where scientists can see the real-world effects of radiation exposure on animal, fauna and flora. The area is full of wildlife, and poachers are common. For Ivan and Maria it was not strange to live and eventually die here. It was their home, and they did not consider it dangerous. Today they both are in their later 70s. They drank the water and grow vegetables. They collected mushrooms and fruits from the forest. 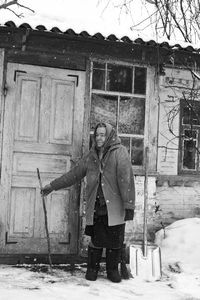 During the long and cold winters, they survived with an oven and firewood that Ivan cut during spring and summer. The abandoned village and the area around were just dense forests. It looked idyllic, and one could not see or feel that the many poisoned trees and vegetation have been soaking up plutonium, iodine, strontium and cesium, which enters into the food chain and could feed nuclear clouds in case of a forest fire. Ivan and Maria only heard about the explosion at Reactor 4 two days after it happened. They knew something was wrong, but nobody was informed about anything during the days of the Soviet regime. 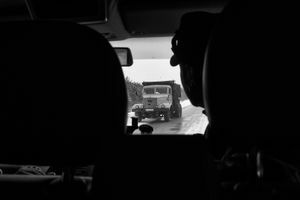 Six days after the disaster they were evacuated to a small village near Kiev. They lived in the village for two years, and then decided to return to their home. Even though the area had been evacuated and was closed to the outside world there was still plenty to do. The next 25 years Ivan worked as one of the many liquidators cleaning up after the nuclear disaster. He removed radioactive material and also worked on a farm where they did experiments with animals, which had received high nuclear radiation. Maria worked in the local cantina and as a painter. Ivan and Maria admitted that they had a strange life, but it wasn’t bad. They were not angry about the accident. Things like that could happen, and governments could not always predict what would happen. They just believed in God. Ivan and Maria thought that it was very wrong that they got evacuated. This was the real crime committed. The contaminants, which included plutonium isotopes with a half-life of nearly 25,000 years, travelled around the globe, depositing radioactive material as far away as the lakes of Japan and the northern parts of Scandinavia and Greenland. It was not merely the most devastating accident in the short life of the nuclear power industry; it was the greatest man-made disaster in history. On the night of the disaster, there were 176 operational staff on duty at the Chernobyl plant, and the subsequent efforts to contain the results of the disaster would eventually involve more than half a million men and women. Many of them were subjected to enormous doses of radiation; some were killed instantly; others died agonising deaths soon afterwards in the Ukrainian capital Kiev and in the specialist radiological wards of Moscow's Hospital No 6. The doses received by the hundreds of thousands of soldiers and liquidators, who decontaminated the poisoned landscape of Ukraine and neighbouring Belarus were either classified or never officially recorded. The disaster had since been clouded by myth, disinformation and controversy. 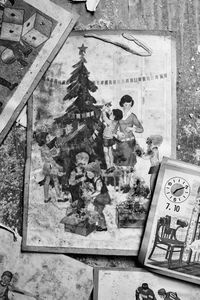 The official account of the Chernobyl disaster was originally documented by the Soviet state only five years from total disintegration. The men who worked at the plant were made scapegoats for what happened. The long-term health effects of the accident continue to be the subject of statistical debate and manipulation by governments, NGOs, scientists and doctors around the world. Now, nearly 30 years after the disaster, the survivors of Chernobyl are scattered across the former Soviet Union, gradually succumbing to cancer and other serious diseases. 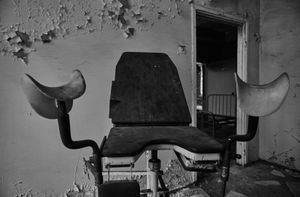 It is unknown how many thousands have died or are suffering from health disorders, mutations and diseases caused by the nuclear disaster at Chernobyl. The damaged Reactor 4 is still a very serious threat to humans and the environment due to cracks and leakages of water and radioactive dust. While we visiting Chernobyl in March 2013, a new roof for the Sarcophagus was under construction. In 2015, it is planned that 1 billion Euro 100-year confinement roof will be ready to slide over the Sarcophagus. 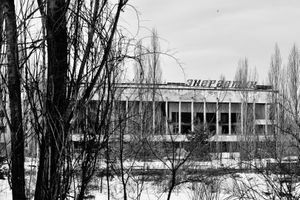 The past and future costs of cleaning up after the Chernobyl disaster are unknown. Some estimate that the accumulated costs for the Soviet Union, Ukraine, Belarus, EU and other countries might be in the order of 400-500 Billion dollars. Nobody knows for sure. 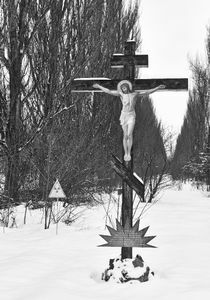 The area around Chernobyl won’t be fit for human habitation for at least another 20,000 years. 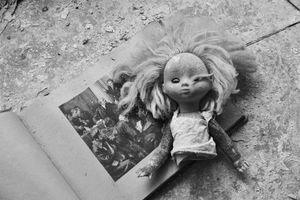 The history and story of Chernobyl and Pripyat are both fascinating and real scary. It is all about horrific communist ideologies and regimes, secrecy, manipulation of people, the Cold War, the worst of scientific and technological blind belief, human and environmental disaster, suffering, tremendous human bravery and heroes that have been forgotten.